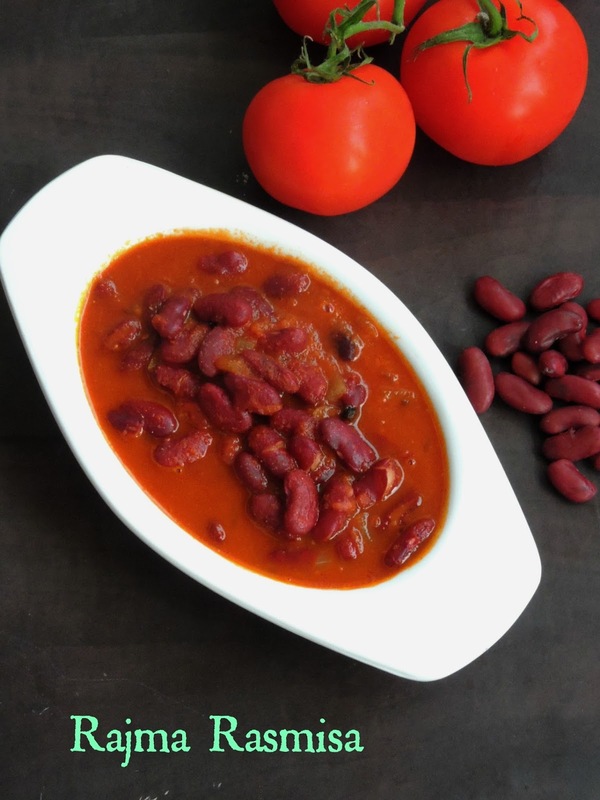 Rajma/Red Kidney Beans/Red Beans, are mostly used in Mexican cuisine, though many delicious Indian dishes prepared with this incredible beans do exists. I have been looking for something new to cook with this fantastic beans and i found this lipsmacking rajma curry at Chef Sanjeev Kapoor's Khanna Khazana. This recipe tempted me a lot to give a try with, obviously i gathered all the ingredients to dish out this fantastic bean. Trust me, this rasmisa tastes absolutely delicious and you doesnt need anything special to make this interesting dish. Served along with a simple pulao or rotis, am sure this masala makes an excellent pair to relish without any guilt. Prepared with simple spicy powders,grated onion and tomato puree, this rasmisa curry is one of the easiest dish to prepare without any fail. This lipsmacking kidney beans Rasmisa is going to be a part of this month's blogging marathon as am running with 5 ingredients for 5 weeks as theme. Every week, i have been showcasing a dry bean and this week's main ingredient is Rajma aka Dry Red Kidney Beans. After dishing out a fingerlicking Tamil nadu style tangy gravy aka Vatha Kuzhambu, am taking you all to North India. Do you know Kidney beans are produced largely there, hence North Indians gets good quality of Rajma. 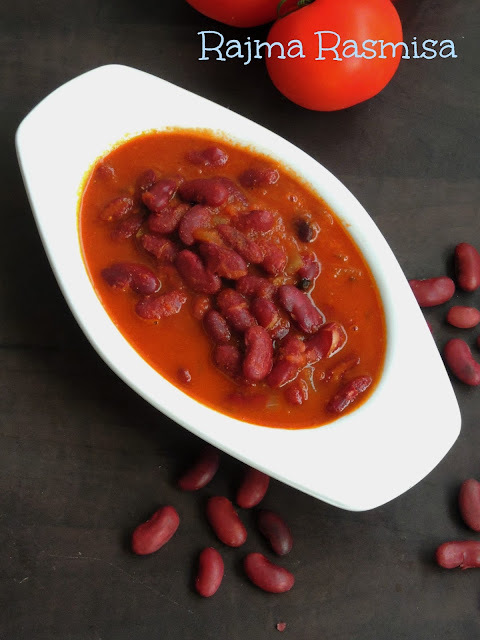 I love rajma very much, needless to say my blog have many delicious dishes i cooked with this protein rich beans, eventhough i have many more to cook and blog about. As much as like chickpeas, i love to cook with this beans often. Obviously my freezer will always have this already soaked rajma as they are handy whenever i feel like cooking with this beans. Soak the kidney beans overnite, next day wash it and cook with enough salt and water in pressure cooker upto 3 whistles. Heat oil in a pan, fry the bay leaves until they turns brown, add the finely chopped onions and saute until they turns transculent. Add the grated ginger, minced garlic, cook for a while. Now add the tomato puree, cook for a while. Now add the coriander powder, red chilly powder, turmeric powder, salt, sauté until the oil gets separates. Add the cooked beans with the cooked water, bring it to boil. Finally add the garam masala powder, cook until the mixture turns thick. Wow ! Early morning raajma rismise from SK ! These are on of the best and i love rhem , in fact can say this is one dish that I simply love . I'm drooling at thIs well prepared dish . Sounds so simple but looks so delicious..
My husband loves Rajma a lot Akka.. Always thinking of different recipes to cook rajma.. This looks super delicious! Rajma gravy is mouthwatering. I am not a big fan of rajma but want to try this. A very filling and tempting gravy. 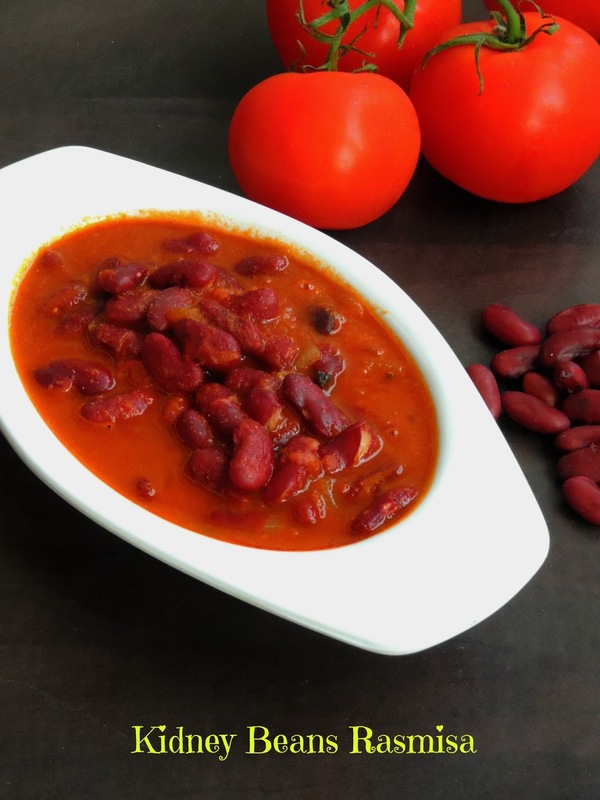 simple and delicious comfort food, rajma curry looks so tempting aks. That is one nutritious and colorful curry with ano interesting name. yummylicious curry. love the name. Bookmarking it to try. Hearty and comforting kidney beans curry. I make a version that is pretty similar to yours. Love this bean in all my curries!! Great recipe. I love all Sanjeev Kapoor's dishes and your recreation looks fantastic as well! Simple and yum to add to it Sanjeev Kapoor recipe!!!! Love it Priya.